Ragunan Zoo is still become the favorite tourist destination of Jakartans to spend their Eid holidays. It is proven that 705,738 people visited Ragunan Zoo during Eid holidays.
" 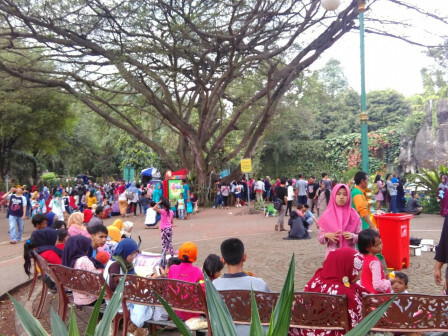 Until 11 AM, we recorded more than 50 thousand people visit the zoo"
Ragunan Zoo's Promotion and Business Development Management Unit Head, Ketut Widarsana informed, Ragunan Zoo visitors number reaches 705,738 people for these nine days of Eid holidays. His side targeted visitor to reach 800,000 people until today. "Until 11 AM, we recorded more than 50 thousand people visit the zoo. We estimate it will increase until this late afternoon. Our target is to be visited by 800 thousand visitors during 10 days of Eid holidays," he stated, Sunday (6/24). He explained, the peak of visitors is on June 18 with total 117,983 people. For detail, there are 20,613 visitors on June 15; 93,085 visitors on June 16; 151,960 visitors on June 17; and 117,983 visitors on June 18. Then there are 102,965 visitors on June 19; 78,898 visitors on June 20; 50,471 visitors on June 21; 24,538 on June 22; and 65,225 visitors on June 23. "The peak is on the fourth day after Eid with total visitor 117,983 people," he conveyed.